In the era of King Henry II, John FitzGilbert is the King's Marshal. He's earned his way there though trial by combat and does a good job with the sums. However when King Henry II dies, John must choose a side as two groups battle for the crown. From a historical fiction point, I found this novel interesting. Most of the English historical fiction I've read takes place later than this so I didn't know a lot about the reign of King Henry II and directly following him. The book does a good job of describing what happened during that time and how much turmoil there was during that time when two families were battling for the crown. From a story telling point, this book had some pretty boring parts. John is an interesting character but his first wife has less personality than a rock. This doesn't help move the story along much. This book just plods along, which doesn't make it all too exciting. You want to find out what happens to John but there isn't a whole lot of action or cliff hangers along the way. I was reading an advance copy so I hope everything had been fixed by the time that the book went for final publishing but there were major problems with placements of quotes. It was difficult to tell when someone was speaking because it was just as likely as not that when the character continued speaking, there would be nothing to indicate this. First Line: "'Why,' John FitzGilbert asked with icy disspleasure, 'does the list say palfreys when the beasts I've just seen in the stables are common nags?'" In another book of bounty hunter Stephanie Plum, this time we learn that Stephanie's cousin and employer has been kidnapped and held for ransom. Vinnie owes a lot of money to some bad people and the team at the bond office doesn't know how they are going to come up with it. Stephanie think she may be able to bag some outstanding bonds but she's not a very good bounty hunter to start with. True to form, there are some very funny moments in this book. Most of which come from the banter between Stephanie, ex-hoe Lula, and feisty Grandma Mazur. When I sit down to read books in this series, I'm expecting something quick, light, and fun. From that perspective, the series never fails to disappoint. First Line: "Uncle Pip died and left me his lucky bottle." A group of wannabe writers respond to an ad in a paper to go on a writers retreat for three months. The goal is to be separated from society so that each person can write their story. The result is the group descending in to madness, interspersed with poems about each person and their story. The stories themselves are pretty disturbing. I'm not usually a fan of short stories and didn't realize this book was short stories. However all of these short stories were glued together with narrative about the retreat. Since each person's story was spliced in to the narrative, there was nothing that connected the narrative to the story so you were changing pace every 25 pages or so. There are few real names being used in this book. Instead, characters are identified by nicknames, such as Miss Sneezy and Director Denial. Interestingly enough, I found that this made it more difficult to keep the characters straight. I couldn't remember whose story had already been presented. This was my first Palahniuk book and overall, I didn't enjoy it too much. I've got a few others of his so I'll try those. Hopefully they are novels rather than short stories. First Line: "This was supposed to be a writers' retreat." Black Beauty is a beautiful horse with good manners. His mom and first master taught him well so that he doesn't stir at loud noises or abnormal behaviour from other animals or humans. This story tells us the ups and downs of Black Beauty's life as he's passed from owner to owner. The start of his life is great and he is free. Not all of his owners are kind and Black Beauty has to suffer through them. Thankfully, this is a child's story so everything comes full circle and the reader is left with a happy ending. Once we learn the core beliefs of Black Beauty and his basic personality, the book becomes much more about the situations he's put in. 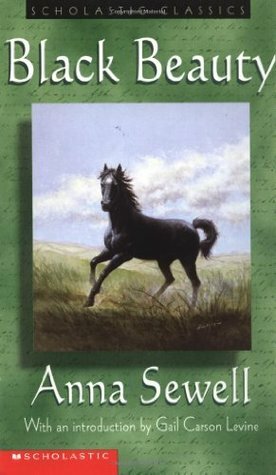 Black Beauty's character doesn't develop much beyond what we learn about him in the first few pages but it doesn't need to because he has such a strong morale base. This book does a great job of illustrating how abuse feels to animals. Though I'm not sure how a young child would take to either the abuse these animals went through nor the loss that was experienced. It could be rather sad, though the overall message is quite sweet. First Line: "The first place that I can well remember was a large pleasant meadow with a pond of clear water in it." Jessica Blackwood, magician turned FBI agent, is back for a second book (see the review Mayne's first book in this series, Angel Killer). Jessica is called in on cases where things can't be explained. This time, a church exploded, leaving absolutely no traces of multiple people known to be there, and not leaving much in the ways of clues as to how the church blew up. The clues lead Jessica down to Mexico with a possible gang connection that puts her in danger. I remember exactly where I was when I read the first book in the series, Angel Killer, which is pretty unusual for me. It was a very unique book and one that I enjoyed. This book is no different. We get to explore Jessica's background even more and the troubles her grandfather and father had raising her. She's a great character; one that doesn't really fit in but that you can still connect with. This novel felt more like a normal mystery compared to Mayne's previous book, which had much more magical elements to it. It was still a great read and one that had me guessing the entire way. A complaint I had with the last book was that Jessica's ex-boyfriend gives her clues or bails her out of situations whenever the team gets stuck which felt like a bit of a cop out. This is still happening in this book but it didn't bother me as much as the first in the series. Thanks to TLC Book Tours for letting me be a part of this book tour! First Line: "'You know what you have to do,' said the distant voice at the other end of the phone." Andrew Mayne is the star of A&E's magic reality show Don't Trust Andrew Mayne, and has worked with David Copperfield, Penn & Teller, and David Blaine. He lives in Los Angeles. Connect with him through his website, Facebook, or follow him on Twitter. When Clarissa's father passes away, she doesn't have many people left in the world. Her mother left her when she was young, her brother is disabled and lives in a home, but her fiance is trying to help her get through this. Going through her dad's stuff, Clarissa finds out that she isn't her dad's biological kid and that her fiance knew about this since she was a child. Clarissa leaves without telling anyone and heads to Lapland (Finland) to find some answers. Her mom is from this area and it's possible that a Sami priest (native people to the land) may be her father. She searches around in this unusual terrain for answers. The writing style is straight forward and a little clipped at times. This may be part of the reason why I couldn't warm up to Clarissa. I didn't understand her relationship with her fiance so when she got so upset at him for withholding information and left without telling him, it didn't make much sense to me. I expected the ending but was a bit disappointed by it. There was one major piece that was overlooked. What about Clarissa's brother? It would have been better for her to be an only child because otherwise this book doesn't wrap up as nicely. First Line: "It was three in the afternoon when my plane landed at the Helsinki airport, but outside my window, dusk was already settling in like a bruise."